I've talked alot about reading and writing on the blog -- but what about math? Our first (formal) exposure in the day to numbers is at the calendar. The helper of the day holds the pointer and points to the numbers and the whole class says the numbers. This helps us match the written number to the number that we say. It also helps the helper learn that we read the numbers from left to right, and then do a "return sweep" at the end of the line and go back to the left again. 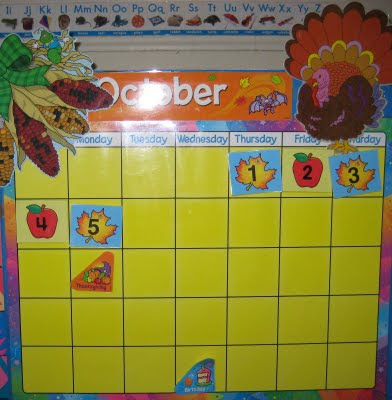 This month we have added a basic abab pattern to the pictures (leaf, apple, leaf, apple) The person who is chosen (by the helper) to put up the missing number (today's date) also has to choose the correct picture (apple number 6 or leaf number 6). I keep notes on who "gets it" and who needs a bit more practice. We have been working on matching numbers with quantity in the math centre. We have begun to estimate and independently make patterns too!